Sensitivity and intuition are not exclusive, inherent qualities of the space science intellectual mind; at the same time, the achievement of expertise requires an act of deliberate practice (Ericsson 1993; 2009; Ericsson & Charness 1994). My question is: why would I doubt that I would be able to do my physics research at the same level as my peers? As far as I know, knowledge is not a monopoly of a specific group, and perhaps it is also true that it may be acquired through different experiences. I love to walk every morning to CfA, a very pleasant walk (on sunny days), using my white cane. Sometimes drivers offer me rides, which I either accept or politely reject. In either case, I am always vigilant, responding to infrequent changes, such as those in voices or pathways, and I maintain a state of alertness to identify those changes. At all times my journey to work is full of items with high or low salience, ambiguity, and uncertainty. Those responses are the certainties I use to persist to my destination. My sight loss has spurred me to develop other ways to observe and study the world – using my hands, my ears, and what some people would call "physics intuition," but which I call the heart. As a computer scientist and astrophysicist, I use the same non-biased sensitivity to auditorily identify events in my observational data … sounds that have brought to life a world that seemed to be vanishing 16 years ago. Now I do science by translating satellite measurements into sound (mapped in rhythms, volumes, and pitches). This humble approach begun as an attempt to familiarize myself with astronomical measurements. I worked 24/7 with my first sonified data set to get beyond mere “familiarization.” The results lead to the notion that sonification could benefit sighted astrophysicists as well. My evidence suggests that when sound is used as an adjunct to visualization for analyzing astronomical data, it increases our ability to spot events or trends of interest that may otherwise be missed. For more on Wanda’s sonification results, see The Sounds of Science and Making Astronomy Accessible for the Visually Impaired. The United States food and nutrition services employs the term "able-bodied adult with no dependents" (Agriculture 2014). I was unable to find a formal definition for this term in the glossary on the department of agriculture page. I had to construct a definition for myself, aided by the Larousse dictionary, and concluded that “able-bodied” refers to persons who are fit, strong, athletic, husky, and tough, among others. Who defines “the norm” and who decides who fits into it? Who sets the limits? The only thing we know for sure is that even an able-bodied person with fully-functioning capacities may someday find that any or all of those capacities are lost. With the advances in technology, it is obsolete to limit space science to these so-called “able-bodied adults,” the ones that may adapt to the perspectives and learning styles currently in use. It is also obsolete to employ the same perspectives and learning styles over and over. 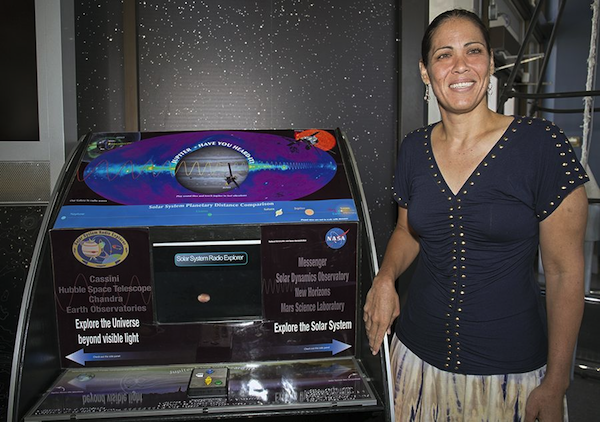 Society looks at space scientists as role models. The greatest driving force for the development of modern civilization has been science and technology. The current generation of space scientists is privileged to witness how the field is opening up to enrich current data approaches with more perspectives and sensitivities. By having in place the tools needed to achieve such purpose, it ensures that the current workforce is enhanced and that people with other (congenitally or late-onset) learning styles may contribute as equals. Space Science may be the cradle for new emerging perspectives. I have no intention of underestimating the difficulties that lie in the way of realizing these goals. The flexible approach brought by the intuition of people with other learning styles can bring everyone on board to spot signatures, patterns, and trends that might otherwise have been missed. I would like to express my appreciation to Dr. Margarita Karovoska for her support while writing this blog post. Agriculture, United States Department of. USDA Food and Nutrition Services. 2014 23-October. Anzai, Y. Learning and Use of Representation for Physics Expertise in Ericsson Ericsson, K. A. and Smith, J. (eds.) Toward a General Theory of Expertise. New York, new York: Cambridge University Press, 1991. Anzai, Y, and T Yokohama. “Internal Models in Physics Problem Solving.” Cognition and Instruction 1, no. 1 (1984): 397-450. Larkin, JH, J McDermott, DP Simon, and HA Simon. “Models of competence in solving physics problems.” Cogn. Sci. 4 (1980): 317-345. Matthews, G., Davies, D. R., Westerman, S. J. & Stammers, R. B. “Vigilance and sustained attention” in Human performance: Cognition, stress and individual differences. East Sussex, UK: Psychology Press. (2000):107-124. Washburn, D. A., Taglialatela, L. A., Rice, P. R., & Smith, J. D. “Individual differences in sustained attention and threat detection”. International Journal of Cognitive Technology, 9 (2004): 30-33.